(Nanowerk News) Mother Nature has provided the lizard with a unique ability to regrow body tissue that is damaged or torn – if its tail is pulled off, it grows right back. She has not been quite so generous with human beings. But we might be able to come close, thanks to new research from Tel Aviv University. Prof. Meital Zilberman of TAU's Department of Biomedical Engineering has developed a new biologically active "scaffold" made from soluble fibers, which may help humans replace lost or missing bone. With more research, she says, it could also serve as the basic technology for regenerating other types of human tissues, including muscle, arteries, and skin. 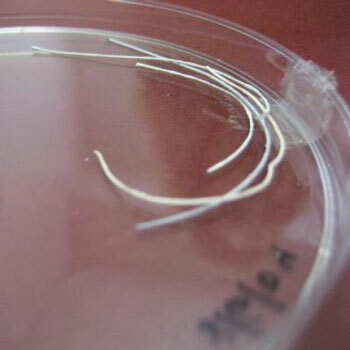 These are composite drug-releasing fibers used as basic elements of scaffolding for tissue and bone regeneration. "The bioactive agents that spur bone and tissue to regenerate are available to us. The problem is that no technology has been able to effectively deliver them to the tissue surrounding that missing bone," says Prof. Zilberman. Her artificial and flexible scaffolding connects tissues together as it releases growth-stimulating drugs to the place where new bone or tissue is needed — like the scaffolding that surrounds an existing building when additions to that building are made. Scientific peer-reviewed research on this scaffold fiber has appeared in a number of journals, including Acta Biomaterialia, and is currently being licensed through Ramot, TAU's technology transfer company. The invention, which does not yet have a name, could be used to restore missing bone in a limb lost in an accident, or repair receded jawbones necessary to secure dental implants, says Prof. Zilberman. The scaffold can be shaped so the bone will grow into the proper form. After a period of time, the fibers can be programmed to dissolve, leaving no trace. Her technology also has potential uses in cosmetic surgery. Instead of silicon implants to square the chin or raise cheekbones, the technology can be used to "grow your own" cheekbones or puffy lips. But Prof. Zilberman says it's far too early to think of such uses. She first started her work in biomaterials at the UT Southwestern Medical Center at Dallas, Texas, and currently is concentrating on various medical applications. One of them intends to make dental implants more effective. She envisions applying the invention to organ tissue regeneration in the future. "Our material is very special," Prof. Zilberman explains. "The fibers not only support body parts like bones and arteries. They're also specially developed to release drugs and proteins in a controlled manner. Our special 3-D matrix can hold together drugs that are particularly vulnerable to breaking down easily. The matrix gives the body shape and form, coaxing it to re-grow and strengthen missing parts," she says. Until now in vitro results on bone have been good, and some basic unpublished results from animal models have shown excellent promise for bone regeneration, says Prof. Zilberman. "It sounds simple, but it's not. It's quite difficult to develop a process for scaffold formation for bone growth. It's a delicate balance to apply only mild conditions that will not destroy the activity of the growth factor molecules." Currently Prof. Zilberman has developed both a fibrous artificial scaffold and an organic scaffold which forms a film. The technology could also be applied to peripheral nerve regeneration. "Our fibers provide all the advantages that clinicians in tissue regeneration are calling for," says Prof. Zilberman. "Being thin, they're ideal when delicate scaffolds are called for. But they can also be the basic building blocks of bones and tissues when bigger structures are needed."